I read this book in early December and included this summary: This book explores finding an inner strength in a very honest way. It is not a simple thing to go from quiet to confident and the transformation is not always smooth. I have had students who when they finally shed their shy personas need some guidance about being polite and not hurtful with their words. Sometimes the words come before the social filters kick in. I thought of those children as I read this book about Millie. Millie doesn’t want to be ignored, she is tired of being “barely there” and unnoticed. So she becomes fierce. As she tries on this new found ferocity, she certainly gets noticed. But nobody wants to be with a Millie that puts getting noticed above being considerate or properly behaved. She even realizes that being fierce can be cruel. Finally Millie understands that she can be noticed for her kindness and consideration. This kind of attention is what feels right to her. I think this book could be quite powerful shared with a class and I look forward to the discussions that it might prompt. Having Deborah read it today allowed me to sit back and watch the children react. They were quite serious during the story. Afterwards, certain things were highlighted in our discussion. Things that they mentioned made me realize how relevant background knowledge can be and how what we bring to a book is shaped by what we have learned. In our room, we just spent a few weeks reading stories with a kindness theme. Students noticed that Millie was kind at the end and some even called her actions acts of kindness. We also have done lessons from the MindUp curriculum and learned about parts of our brain. Children brought up that Millie was controlled by her amygdala and should have taken some breaths to make better decisions. Very sweet how the children brought these things to our discussion. We were all rooting for Millie. It was agreed that she would be happier being kind. The children identified many of the emotions she felt throughout the story: loneliness, sadness, jealousy, guilt, pride, relief, etc. A powerful little story to prompt discussion about how we treat each other and how we make ourselves noticed. Kelvin: When she became fierce, she went home and messed up her hair. At the end, she clearned he Grandpa’s shoes and she loved to be small and quiet. Vicky: My favourite part was when Millie Fierce was nice. Why did Millie be nice again? Ethan: At first she was lonely. Then she got fierce. She made her hair spike up and freaky. she had loud boots like cowboy boots. She acted a bit like a devil. Evil like I don’t know how . . . Then she did some acts of kindness. Andrew: Why when the three girls stomped on her picture, can’t Millie draw another flower? Kevin: Why did she have a hard time to make a friend? Why did she take the cake and then feel guilty? Why did her amygdala take over? Ava: I liked when she became fierce. Millie was lonely then fierce then she was nice. Shereese: She was nice then she became mean because no one didn’t like her. Why no one liked her at the first? Heman: Millie Fierce was lonely at the beginning. Her amygdala took over. I think Millie Fierce’s heart became fierce. Millie messed up her hair when she was fierce. Kala: When she was being bad her heart got broken. But when she was nice, it got put back together. I like this book. I want to know from the author: Where were you born? I love you. Gracie: Why did no one like Millie at the beginning? I liked it when at the end it said “Mostly.” To Jane Manning: You are a good drawer like my mom. She’s an illustrator for kids books. I think it was a good story. But why did she want to be so fierce? When she stole the biggest piece of cake, she felt guilty. I really liked the story. It teaches you a lesson: be nice to get peoples attention. This entry was posted in BLG Reads this week and tagged BLG Reads, favourite illustrators, fiction, great read alouds, Jane Manning, making connections, picture books by carriegelson. Bookmark the permalink. I’ve never read this book, but after your post, I want to. It sounds like a very powerful. On a different note, I’m really intrigued by your student reviewers. What a great way to focus on some students during book talks, and what a great way to zero in on reading comprehension skills. Have you done a post on student reviewers? How do you establish this routine in the classroom? I’d love to hear more about this! Thanks for the comment and questions. Our school is fortunate in that every week four primary classrooms host a reader from the BLG law firm for an hour. The reader (might be a lawyer, a receptionist, a data entry clerk . . . ) comes once a month so that each class has four volunteers that visit regularly. Each week the reader shares a new picture book with the class and then spends the remainder of the hour listening to individual students read. There is usually time to listen to four students read. The picture book stays in our classroom collection for the year and then we pass all the books to our librarian and they become part of the library collection. I have been looking for ways to have the children to engage more with each book so our weekly routine goes something like this: after the reader shares the story with all of us and goes out into the hall with the first reader, we begin a brainstorming session. The children share questions, favourite parts, connections, parts they didn’t like, etc. Because we are a Grade 2/3 class, I write key words from the discussion on the board for both spelling and memory reference. Sometimes I lead the discussion in certain directions but by this point in the year the kids are fairly confident in being able to share and talk about the book with minimal guidance from me. (We talk books a lot in our class!) Students then return to their desks and fill out a review form in their Reader Response notebook. The forms are glued into the top part of a notebook page and have a space for title, date, the BLG reader’s name. Then there are some guiding questions. It’s pretty simple and open ended: What happened in the story? What were some favourite parts? What were you thinking as you listened? Do you have any questions? I encourage them to share whatever is on their mind. Sometimes it is a list of questions. Sometimes they want to describe a favourite part. Other times they talk about connections. Some kids include a comment for the author or even a comment for the reader. Just before the reader leaves, the kids have got into the routine of sharing their completed reviews. Usually only one or two kids can do this but it allows for more discussion opportunities and its a chance to share their thinking with a different adult. I then type in completed reviews along with a short summary on this blog. We haven’t got to the point of having our own kidblogs which is the direction I will eventually get to I hope. I try to share our reviews with the author – especially if I can find them on twitter or if they have a blog. Last week the author responded on the blog and asked the kids a question. We brainstormed answers and I tweeted the author a photograph of our chalkboard full of ideas. She loved it! Thanks for such a detailed reply! This helps a lot. I’m now thinking about how a similar activity could be done in a Junior Classroom. It’s great to have students thinking and talking about books, and it’s clear that your activity allows for both. 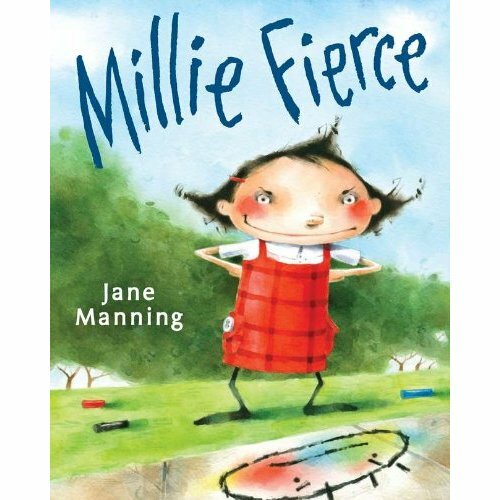 Thanks for reading my “Millie Fierce” and discussing it in class. I think all your comments were very thoughtful. Vicky – Millie was nice again because she realized being fierce can hurt others. She didn’t want to do that. Andrew – Millie did not feel happy inside after her flower was ruined, so she did not want to draw a happy thing anymore. Kevin – I think her fierceness took over and just got out of control. It took some thought and effort on Millie’s part to put a stop to it. Shereese – It wasn’t that people didn’t like Millie, they didn’t pay attention to her. And Millie didn’t know how to get attention in a nice way. So, she got it in a bad way, which she discovered was not so great after all. Kala – I was born in Bridgeport, Connecticut, USA, and I often felt overlooked like Millie when I was a kid. I didn’t get fierce very often (even though I sometimes felt like it ). Millie’s heart was broken & put back together. That’s lovely. Gracie – Millie didn’t plan on being so fierce. Her fierceness (or amygdala, which I like!) just took on a life of its own. Sometimes that can happen, and it’s up to us to bring our actions back in line. Kelvin – I drew Millie’s hair frizzy because MY hair is frizzy and it can make me feel a bit fierce! Ethan – Yes, she did stomp about and was a bit of a devil (I like that!). Ava – I also think fierce people are lonely people! Heman – I agree: Millie heart became fierce! My main point with “Millie Fierce” is that our feelings can be very powerful. Sometimes other people can hurt our feelings. We can’t control how other people treat us, but we can control how we react to that treatment. We can choose to be kind rather than fierce. And kindness can be the most powerful of all emotions. Jane – thank you for these wonderful replies! The kids will be over the moon. I’m so excited to share them with them today! Thank you!! !